Kevin was woken by persistent beeping. “Damn…” he said as he checked the electric meter; he pushed the green plastic key in. “…there should be plenty,” he mumbled, but it appeared it hadn’t gone on. He found the receipt soaked with tea at the bottom of the bin. It told him he’d put £30 on the previous day, Christmas Eve. He pressed the Emergency: all but 1p had already, automatically been used during the night. “Damn!” he said as the room went dark. Opening the curtains, the room flooded with orange-street light. Kevin rang Customer Services. A message wished him season’s greetings and told him they were closed until the 27th. He rang the Emergency number and was told there was nothing they could do as he wasn’t registered as a person at risk. He thought the only place that may be open would be Rupyal’s. They didn’t celebrate Christmas. It was drizzling but mild for the mile and a half walk. They usually opened at 5.00am, but today a notice said they wouldn’t open until ten. As Kevin turned towards home the rain changed to an icy blizzard of snow, surprising him. It hadn’t been mentioned in the weather forecast. The street lights were transformed into an odd pale-creamy yellow. Morning hadn’t yet broken and it felt much darker now. He choked as he breathed in what smelt like a bonfire. The snow was thickening and getting slippery under foot, Kevin pulled his jacket tight. A clanking and crackling was approaching from behind him. He looked back and there was a single round light pushing through the storm. The noise stopped beside him and a tram pulled up. A man in grey coat and peaked cap leant out from the back. “D’you need a ride, mate?” he called out. “You going up High Street?” Kevin said without thinking. Kevin jumped on. The tram was empty and was cold, but dry. It smelt of stale tobacco and sweat. A sign told him “no spitting”. The conductor came up to him. “Sorry,” Kevin said, “I’ve got no change on me”. The conductor smiled. “Dunna worry duck, it’s Christmas, no inspectors today,” he said and winked. The tram rattled along, not stopping. Kevin wiped clear a patch on the steamed-up window to peer out. The streets were much darker than usual but at least the snow was relenting. He recognised the church in the gloom but couldn’t see the war memorial, which was his usual place to stand up and get ready for his bus stop. As he stood the conductor pulled at a wire which ran along the ceiling. The clattering of the tram slowed down as it stopped. “Is this a special for Christmas? Feels like the real thing,” Kevin asked the conductor. “No, we run everyday, usually packed at this time,” he replied looking at him oddly. 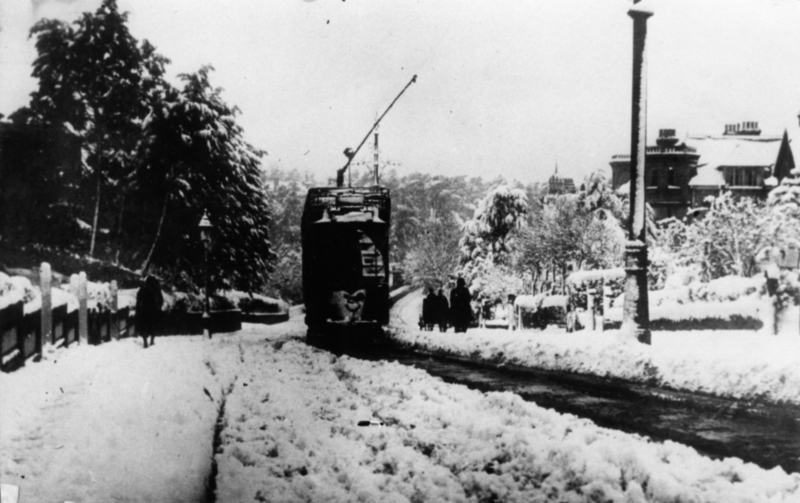 The tram grumbled off up the hill as Kevin turned towards his flat. He looked back up High Street. There was no sign of the tram or snow, and the orange streetlight glare competed with a pale lightening in the sky. Trying the electric key in the meter one last time, the power immediately kicked in, the tree lit up, the television flickered on and the central heating pump hummed into life. Kevin was making a pot of coffee when he heard an envelope drop through the door. It was a Christmas card, his first. “Odd…” he said when he’d opened it, “…how very odd”. It was a picture of a tram, dated 1908, travelling past the parish church. Inside, it was unsigned.